A Somali Muslim, Mohamed Osman Mohamud, was arrested in Portland, Oregon, as he was trying to explode what he thought was a bomb-filled van at a Christmas tree lighting ceremony. The explosives were fake, supplied to Mohamud by undercover agents; nonetheless, “the threat was very real,” said Arthur Balizan of the FBI in Oregon. “Our investigation,” said Balizan, “shows that Mohamud was absolutely committed to carrying out an attack on a very grand scale.” Yet in response, the mainstream media and Muslims in Portland have followed a drearily familiar script. Yet despite Mohamud’s avowedly Islamic motivations, the Imam Yosof Wanly of the Salman Al-Farisi Islamic Center in Corvallis, Oregon, followed a predictable and oft-repeated pattern when he downplayed Mohamud’s connection to the local Muslim community and insisted that Mohamud’s plot was “completely, clearly, textually denounced in the Islamic religion.” He offered no texts from the Koran or Hadith to back up that assertion, and no reporter asked Wanly if Mohamud could have been inspired by such texts as “kill the idolaters wherever you find them” (Koran 9:5). No reporter asked him to explain what was incorrect from an Islamic standpoint about the statements Mohamud had made about the Muslims’ obligation to fight defensive jihad against invading infidels. No reporter asked him what programs he had instituted or planned to institute at the Salman Al-Farisi Islamic Center to make sure that no other members of his community misunderstood the Religion of Peace as spectacularly as did Mohamed Mohamud. No reporter asked him what steps he was taking to cooperate with law enforcement officials to make sure Mohamud had no accomplices or allies within the mosque. Meanwhile, generally after a jihad attack in the United States, whether successful or not, mainstream media outlets run multiple stories about how Muslim communities fear a “backlash” against innocent Muslims from enraged “Islamophobic” rednecks. 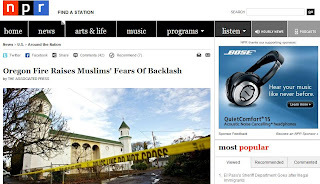 Of course, such “backlashes” never materialize, but the purpose of such stories is to shift the public’s attention away from the reality of Islamic jihad and onto the fiction of Muslims as victims, living in fear of vigilante attack in the United States. In reality, hate crimes against Muslims accounted for only eight percent of crimes thus classified in the U.S. in 2009, according to a recently released FBI report. Blacks and Jews were far more likely to be victimized – and far less likely to be the subject of fawning media reports featuring hand-wringing over a “backlash” against them. If this was truly a retaliatory vigilante attack following Mohamud’s attempted jihad bombing, then it must unequivocally be condemned. It is important to note, however, that while the Hamas-linked Council on American-Islamic Relations (CAIR) called on the FBI and local police to protect the mosque, CAIR and other Muslims have not hesitated to stoop even to fabricating “hate crimes,” including attacks on mosques. CAIR and other groups like it want and need hate crimes against Muslims, because they can use them for political points and as weapons to intimidate people into remaining silent about the jihad threat. Yet no one is even raising the possibility that the attack on the Portland mosque could have been faked. And so with this latest jihad plot, the same script plays out yet again. With every new jihad action, all the media and political elites need to do is hit their marks. What is needed, and is long overdue, is some independent thought, and a realistic appraisal of the implications of plots like these. Neither is on the horizon.